Your donation will help support my training costs. The amount of time, effort and expense it takes to become a world class athlete is unbelievable. I have the time, the effort and the physical gifts. Currently I train in the gym 6 to 7 days per week. Your support will help to sustain my training: travel expenses to meets and training centers, lodging and meals while at events, coaching, gym expenses and nutritional supplements. The list seems endless. I’d appreciate your support in helping me achieve my Olympic goal. Together, with your generosity and my hard work, we can make this Olympic dream a reality. You may also donate by paying with a check. 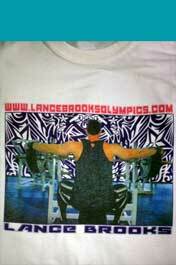 Make check payable to: Lance Brooks Olympics. Support Lance with a donation of $50 or more and receive a free t-shirt. T-shirts are available for purchase at $30 each. Change quantities on cart page, continue shopping to add additional sizes.